The first tiling problem using the 12 pentominoes was designed by Henry Dudeney and published in 1907, and in the years since much has been done to expand the realm of polyform puzzles, by finding new shapes to tile and new shapes of pieces to tile them with, by using larger and larger pieces and sets of pieces, by defining sets of pieces using criteria other than their sizes, by exploring higher dimensions, et cetera. This is all great, but to me many of these problems miss the aesthetic ideal approached by the simple problem of tiling a rectangle with the 12 pentominoes. I've found a few variations on this problem all using one additional element: color. All of these problems involve colorings of the set, that is, choosing colors for pieces so that no two pieces that border each other are the same color. A famous theorem states that it is always possible to color a set of regions on the plane using only 4 colors. In polyomino tiling problems it is frequently possible to find 3-colorings, and basically never possible to find 2-colorings unless you use very contrived sets of polyominoes or shapes to tile. Mathematicians generally consider regions that meet only at a single point to not border each other, (simply because this is required to make the 4 color theorem and a lot of other stuff work,) but there is no reason why we have to follow this. We'll call the coloring scheme that considers two pieces to border each other even if they meet only at a point strict, and the scheme that only considers them to border each other if they share an edge non-strict. Of course it occurred to me that this set would be great for pentomino explorations, since the pieces of each type could be placed on the squares of a grid to form different pentominoes. 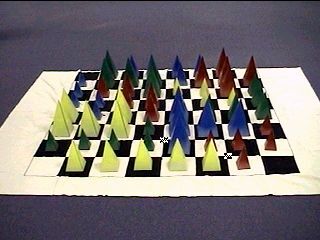 And the set naturally lends itself to coloring problems too; 4-colorings can be made by keeping the pentominoes with the same color of pieces from touching, and 3-"colorings" can be made by keeping those with pieces of the same size apart. There are also 12 hexiamonds, (pieces composed of 6 equilateral triangles,) which can tile numerous shapes. Do any of these shapes have tilings with Icehouse colorings? It's possible to generalize the notion of an Icehouse coloring to any set of simultaneous colorings with the property that each color combination occurs exactly once. We'll use the notation "(n1, n2, ... ni)-Icehouse coloring" to denote the number of colors in each coloring of a set with n1*n2* ... *ni pieces. So, the first step is to find sets whose members' numbers have felicitous factors. There are 20 rhombic pentominoes. (4, 5)-Icehouse colorings shouldn't be too hard to find. I wonder what proportion of 4-colorings can be used in one. There are 60 one-sided hexominoes. Can a (3, 4, 5)-Icehouse coloring be found for a rectangle tiled by these pieces? Suppose you have a coloring of a polyomino tiling with no "crossroads", that is, no point where four pieces meet. How many different ways can the space around the points where three pieces meet be colored? Of course, it depends on how many colors you use, but if there are four colors, and reflections and rotations of the combinations are considered equivalent, there are 12. I noticed that 12 seemed to be a reasonable number of "3-roads" to occur in a tiling of a 6x10 rectangle with the pentominoes, and I asked on the polyforms mailing list whether it was possible to find a coloring of such a tiling for which each of the 12 combinations occurred once. So I think it's a pretty cool bit of luck that only months after the solution to the Icehouse coloring problem was found, I happened upon a second problem with a unique solution. Of course, the best bit of luck was finding a mailing list with people willing to modify their programs to solve these problems. Update: (January 2003) Aad van de Wetering has found some new solutions for this problem tiling different shapes. The page is in Dutch, but the diagrams speak for themselves. Unlike the first two problems, this one generalizes pretty well to any set of polyforms composed of cells with edges of uniform length. So go knock yourself out finding loose 2-colorings. The 6 pentominoes that are symmetric over reflection are the same color. The other 12 pentominoes are colored with the remaining two colors so that pentominoes that are reflections of each other are different colors. Since I collect pentomino coloring problems, it should come as little surprise that I was intrigued by the cover of Puzzle Fun 16. Puzzle Fun was a 'zine produced by Rodolfo Marcelo Kurchan in the '90s covering a variety of polyomino problems. For a long time, only images of the 'zine's covers were available on the web, but now Kurchan has placed the content of all of the back issues of Puzzle Fun online. Puzzle Fun 16 focused on pentomino packing problems. Packing problems differ from tiling problems in that empty space is allowed, and the goal is to minimize the amount of empty space required. Packing, usefully, makes some kinds of problems possible to solve that would not be solvable as tiling problems. One type of puzzle made possible with packing is finding a 2-coloring of a set of polyominoes. This is the puzzle type I saw on the cover of Puzzle Fun 16. A strict two-coloring of a set of pentominoes. Two differently colored sets of pentominoes, as in the Puzzle Fun problem, with a non-strict 2-coloring. Bryce Herdt pointed out that adjoining my solution to the second problem with a flipped and color-inverted copy of itself would produce a solution to the latter problem. I hope that I have shown that the hundred year old problem of tiling pentominoes still has some life in it, and I believe that there is still much more to be discovered. If you're interested in learning more about polyominoes and other polyforms, Andrew Clarke's Poly Pages site is a good place to start, and the polyomino page on David Eppstein's Geometry Junkyard is a good place to find random juicy info nuggets.